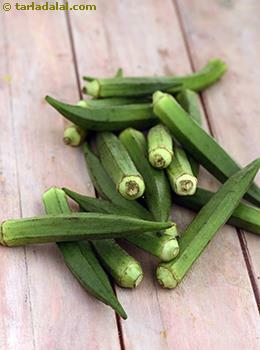 Okra is a type of green vegetable, long finger like, having a small tip at the tapering end. The taste is very specific to the vegetable and generally liked by children. The glycemic index of lady finger is 20 which is considered as low glycemic index range. Is Lady Finger safe for Diabetics? Lady finger is very low in glycemic load because of which it is a good option for diabetics. This is best understood by the amount of carbohydrates (i.e. 6.2 grams in 1 cup) in one serving of lady finger. With such low glycemic load of lady finger, your blood sugar levels won't fluctuate rapidly. Also because of the fiber content, the absorption of nutrients is slow and gradual. You can eat lady finger in various forms of sabji such as bharwa bhindi, bhindi onion stir fry, bhindi masala gravy along with your roti making it more nutritious. Bhindi being a very good source of potassium and low in sodium it is also recommended for people with high blood pressure. It maintains and regulates your blood pressure. Add on it is cholesterol free. Thus will fluctuate your lipid profile. Is Lady Finger suitable for Weight Loss? Being very low in calories (20 calories in 1 cup. approx. 70 grams) and negligible amount of fats, ladies finger is an ideal vegetable for weight loss. Have Bhindi along with Bajra Roti or Jowar Bajra Roti . 1 cup of lady finger provides 2.3 grams of fiber which will add bulk to your meal. Have it in your meal with multigrain chapatti and you will feel satiated for the next 3 to 4 hours without the fear of having extra calories. Have small and frequent meals to ensure you do not starve. Choose your meal combination wisely to remain fit and healthy.